I don't know how long ago, but quite a while ago, when I first became a garage sale attendee, junker, collector, I found the most fabulous wheelbarrow! It was $15, and I couldn't get it home fast enough. I was so afraid someone else would offer more for it, and steal it away from me. I immediately found a couple of galvanized laundry tubs to set in it. The plantings have changed over the years but I don't think I have ever not planted Nicotiana in the large tub. Here is the first digital photo I have, of the wheelbarrow, in 2004, along with our new pug puppy Otis. Nicotiana, heliotrope, and purple and pink surfina petunias and Otis. Mixed Nicotiana and surfina petunias. Mixed Nicotiana, Dusty Miller, Million Dollar Bells and Asparagus Fern. Nicotiana, Gaura, Heat Tolerant Lobelias, and Million Bells. 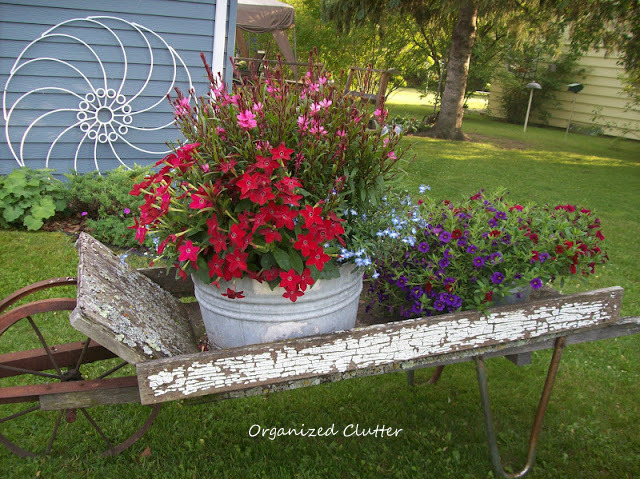 I love the rusted metal legs and wheel, the chippy white paint, the galvanized laundry tub planters, all combined with beautiful summer flowers! This is a favorite of mine and my neighbors! I seal it every couple years with Thompson's clear water seal to keep it from rotting. It is so cute! Flowers are so pretty too! 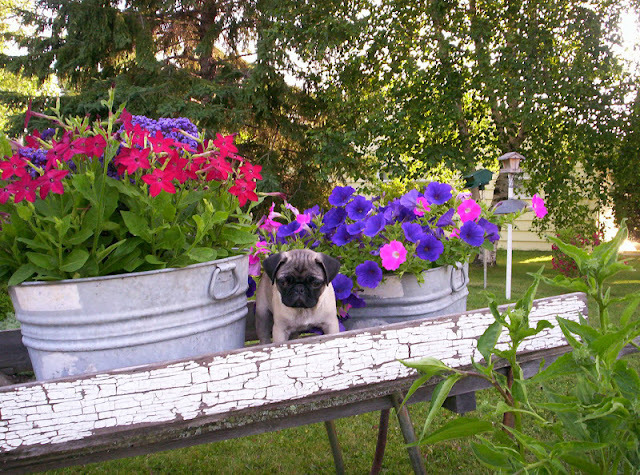 I love your wheel barrel & flowers and your puppy, Otis is adorable. 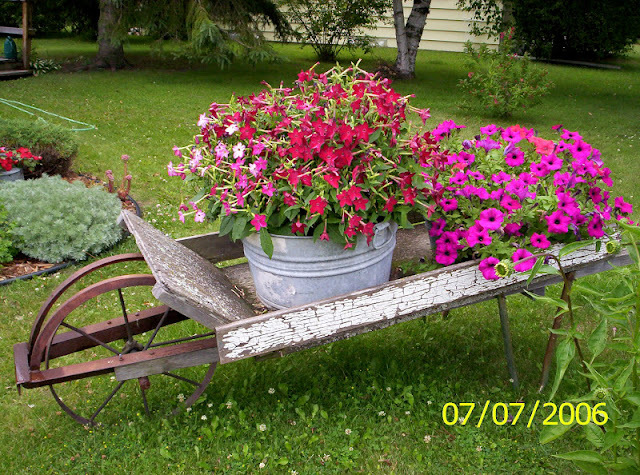 Wow..I love all our garden"furniture"...that wagon is to die for...your garden is beautiful.!!! Love the galvinized laundry tubs as planters! Great idea!! Saw you over at Tablescapes by Diane and loved the name of your blog and decided to check it out. How lovely is that wheelbarrow and the plants in it are beautiful. What a nice landscape piece. Do stop by when you have a minute. Blessings to you! That looks so pretty, Carlene! I love seeing these incorporated into people's landscaping; I think it adds so much interest and color. Hi Carlene- I am visiting from Barb's party too and I am a new follower. I love your wheelbarrow and I am going to copy it! Wow, what luck. I never, ever find anything so wonderful! Love how you use it, too! I totally understand why you grabbed it up! Visiting from Mary's party. The flowers are gorgeous! ;) I love the galvanized tub idea. I have one as well unfortunately my gardening skills aren't the best. I would love to be able to create that. That wheelbarrow has served you well over the years... and you've known just what to do with it. 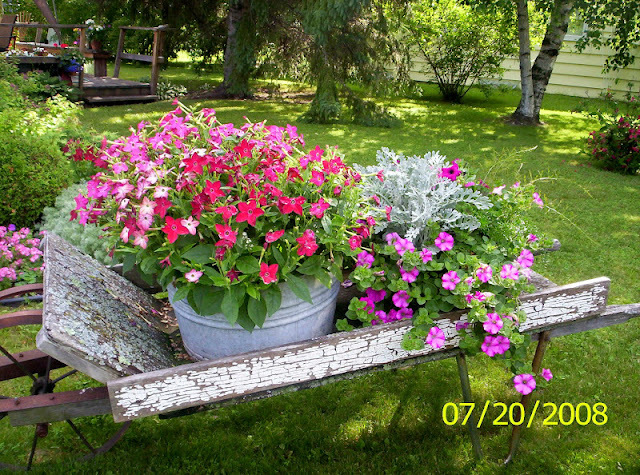 I love the galvanized tubs filled with flowers! How Cheerful! It's so pretty! Love how it is weathered and that photo with Otis is adorable! Thanks for linking up to Share the Love Wednesday at Very Merry Vintage Style!